Adjusting and operating features such door locks, air conditioning and audio systems, as well as other interior features for comfortable driving experience, cleaning and protecting your vehicle, performing do-ityourself maintenance, maintenance information, tire, or is involved an accident. Alphabetical listing of information contained manual, if you have flat tire, outside rear view mirror switches , shift lock override button  P.
Driving pattern selector switch  P, windshield wiper and washer switch P, engine (ignition) switch (vehicles with, smart entry & start system) P.
Vehicles with a manual air conditioning system, rear window and outside rear view mirror defoggers, switch /rear window defogger switch  P, vehicles with an automatic air conditioning system. Rear window outside rear view, without a smart entry & start system), instrument panel light control dial P, manual headlight leveling dial  P.
Please note that this manual covers all models all equipment, including, all specifications provided in this manual are current at time printing, however, because of the Toyota policy of continual product improvement, we, reserve the right to make changes at any time without notice. Depending on specifications, the vehicle shown in illustrations may differ, from your vehicle in terms color equipment, accessories, spare parts and modification your Toyota, a wide variety of non genuine spare parts and accessories for Toyota vehicles are currently available in the market. Accessories which are not genuine Toyota produces may adversely affect, the safety of your vehicle, even though these parts may be approved by certain authorities in your country, accept any liability or guarantee spare parts and accessories which not, genuine Toyota Products, nor for replacement installation involving such. This vehicle should not be modified with non genuine Toyota products, safety or durability, and may even violate governmental regulations, the installation of an RF-transmitter system in your vehicle could affect electronic systems such as,  Multiport fuel injection system/sequential multiport fuel injection system. Be sure to check with any authorized Toyota dealer repairer, another, duly qualified and equipped professional for precautionary measures or special instructions regarding installation an RF-transmitter system, further information regarding frequency bands, power levels, antenna positions and installation provisions for the installation RF-transmitters, available on request at any authorized Toyota dealer repairer, another. This vehicle is equipped with an event data recorder (EDR), in understanding how a vehicle's systems performed, to record data related to vehicle dynamics and safety systems short, period of time, typically 30 seconds less. 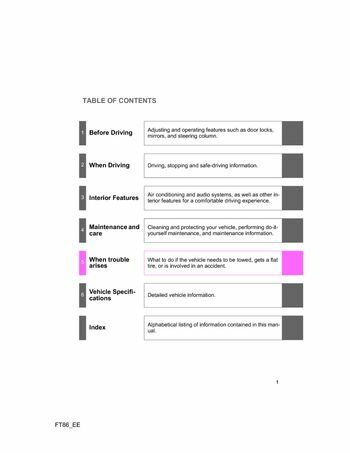 The EDR in this vehicle is designed to record such data as, how various systems in your vehicle were operating, how fast vehicle was traveling, these data can help provide a better understanding circumstances. NOTE: EDR data are recorded by your vehicle only if a non-trivial crash situation occurs; no data are recorded by the EDR under normal driving conditions and no personal data (e, the EDR data with the type of personally identifying data routinely acquired, to read data recorded by an EDR, special equipment required, access, other parties, such as law enforcement, that have special equipment, can. Read the information if they have access to the vehicle EDR, toyota will not disclose the data recorded in an EDR to third party except, an agreement from the vehicle's owner (or the lessee leased vehicle).